KidCheck, providers of secure children’s check-in software has updated and improved its children’s check-in iOS mobile app providing a new and improved look with an easier to use, more intuitive user interface, and increased reliability. More about KidCheck can be found at http://www.kidcheck.com. We've combined all the great existing features of KidCheck's mobile app with some new updates based on customer feedback, creating an even better overall check-in experience. 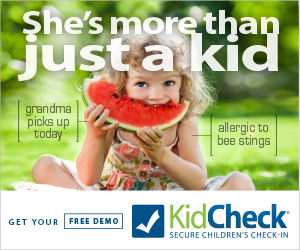 KidCheck, providers of secure children’s check-in software, is pleased to announce it has updated and improved its children’s check-in mobile app. The updated iOS mobile app has a new and improved look and feel, plus an easier to use, more intuitive and responsive user interface. It also delivers increased reliability. Mobile check-in provides churches and other organizations caring for children with many benefits. These include added flexibility, shorter check-in lines, a personal touch, and the convenience of allowing volunteers to walk around with a tablet device to easily check families in. “We’ve combined all the great existing features of KidCheck’s mobile app with some new updates based on customer feedback, creating an even better overall check-in experience,” said Alex Smith, KidCheck CEO. 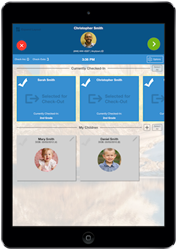 The KidCheck mobile app allows organizations caring for children to check families in using an iPad® or tablet device for Android™. The updated iOS mobile app is available for download from the App Store (SM). Apple, the Apple logo, and iPad are trademarks of Apple Inc., registered in the U.S. and other countries. App Store is a service mark of Apple Inc. Android is a trademark of Google Inc. Google Play is a trademark of Google Inc.